In my classes recently we’ve been talking about and working with Quotes of the Day. I’ve been putting them on Sitzman ABC’s Facebook page, but I realized that if I only do stuff on Facebook, there will not really be a reason to come to this site. And I paid money for this site! So anyhow, I decided I’ll put some of the Quotes of the Day on this site as time goes by. I’ll also try to highlight important vocabulary or other aspects of some of the quotes. How would you interpret that quote? 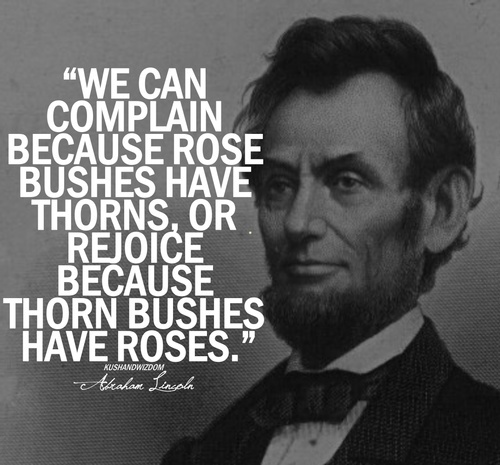 My students thought Lincoln meant we have two choices: to be optimistic (and focus on the roses) or to be pessimistic (and focus on the thorns); but whatever you decide to focus on, you’re still looking at the same bush. So it’s our own choice if we want to be an optimist or a pessimist. bush – A plant that is similar to a tree, but smaller. Roses are examples of bushes, and other types of bushes are used for decoration or fences. thorn – The sharp pointed objects on some plants, including roses. to complain – To say that you don’t like something; to protest. to rejoice – To be very happy; to praise; to cheer. be pessimistic / optimistic – These words are adjectives, so they describe a person, thing, or idea. a pessimist / an optimist – These words are nouns, so it is a type of person. What about you? Are you optimistic or pessimist? Do you focus on the roses of life, or the thorns? Thanks for reading — have a great day!